Over the New Year's vacation, I've been backing up my photos of 2013 to Bitcasa (link provided to get you more free space, I already have unlimited). Unfortunately, for a good part of the year, I was without Internet at home, which means that my backups have been held back a little. It is a slow process when you are trying to catch up on months of work. The easy way to do this would be to have a computer, Windows or OSX, set up with hard drive mirroring. This way, any file I store would automatically get backed up to Bitcasa. There are two problems with that approach in my current situation. The first problem is that I don't have a Windows or OSX computer. My wife has a laptop which mirrors all her files; but, in my case, I operate off an Android tablet and a Chromebook. The tablet runs the Bitcasa app, which only backs up photos I take from the camera. The Chromebook only has access to the browser version of Bitcasa, which has the limitations of browser versions of anything. The second problem to mirroring is that you still need hard drive space on your end. If you plan on backing up Terabytes of data, you need Terabytes of hard drive space to be mirrored. The funny thing is that if you have a thumb drive or memory card, Windows will mirror those to your account. This is a really cool trick which allows you to have multiple external drives that you can juggle about and ensure they are backed up. But, that goes back to the original problem, I don't do Windows. So, I am currently limited to backing up photos manually through the browser. Not Bitcasa's fault, just me being non-mainstream. Now that my Internet is back, there is so much stuff that I've been wanting to back up just waiting to be uploaded. I wish I could open the floodgates; but, like most internet connections, mine is asymmetrical. I have a much faster download speed than upload speed. So, uploading is taking a while. Once this glut is backed up, things should be smoother. 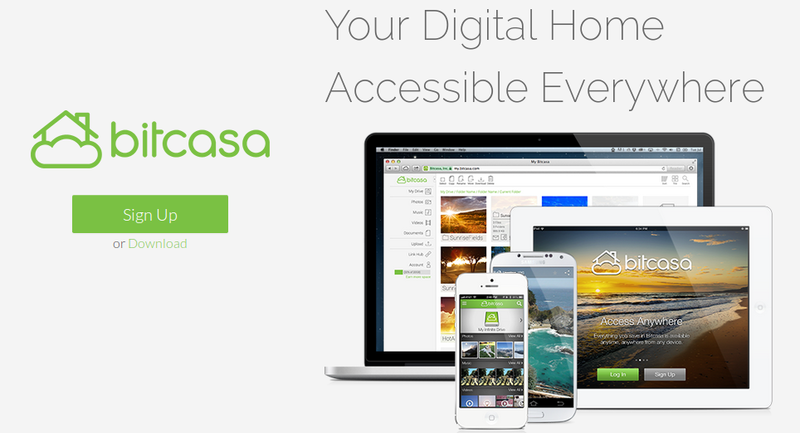 Despite all these issues that I have mentioned, I still recommend you sign up for, at least, a free Bitcasa account. Just like Dropbox and other cloud storage providers, Bitcasa allows you to share files with others simply by uploading the file and then sharing the link. Compared to other cloud storage services, like OpenDrive, Bitcasa is now a bit more expensive. I was fortunate to get into Bitcasa when they were in Beta, which gives me a low price on unlimited backup when it was available, now selling at $99/month. Compared to other services, Bitcasa is less expensive than services such as Dropbox, when you compare per GB. Getting 1 TB for $10/month on Bitcasa is a great deal when compared to less storage for the same cost. However, if your needs run past the TB, you are actually looking for a backup service like Crashplan, which offer unlimited storage for the same low fee. The drawback to the backup services that offer unlimited backup for flat fees is that it's a flat fee per computer. So, if you have a desktop, a laptop, and laptops for the kids, it can add up to a sizable monthly subscription. And, of course, you still need physical drives to back up. At first, I really, really liked Google Drive. The price and convenience were spot-on for me. But, as my storage needs have grown, $49.99/mo for 1 TB seems meager compared to Bitcasa's 5 TB at the same price. Thus, Google Drive, Dropbox, and other services are great as collaborative spaces; but, they are expensive for long-term file storage. Speaking of long-term, even Amazon's AWS Glacier service, which charges $0.01/GB/month is the same $10/mo Bitcasa charges AND is wonky in terms of access and file management. There are many services out there that differentiate themselves with different ways of charging you for storage. It is difficult to compare apples to apples as they rarely offer the same tiers of service, the same pricing, or the same features. Backing up your files is a must, no matter what. There are plenty of services available for low storage needs at nominal costs. But, if your storage needs are great, your options are rarefied. In this case, you are looking at backup as more of a business investment and should be prepared to pay accordingly. Definitely, shop around.